"Thanks!" to GigisGoneShopping who shared a post over at Track Maven (click here to read in its entirety). It chronicles J.Crew's use of social media. As of late, J.Crew has served as a standout example at the intersection of being fashion forward as well as analytically proactive. 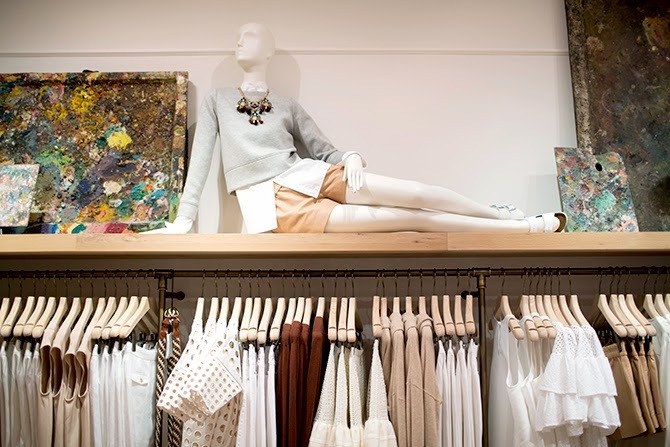 J.Crew’s CEO, Millard “Mickey” Drexler, has been at the forefront of this transition. As chronicled in The Business of Fashion, Drexler’s data-driven approach to fashion borders on infamous. “We communicate our brand message to customers through all channels, including our websites, our catalogs, email marketing, online advertising, and our social media presence. Our core marketing objectives are structured to drive awareness and differentiation of our brands, increase new customer acquisition, maintain and build customer retention and loyalty, and build brand awareness internationally." Yes, you read that right: “J.Crew customers who engage with us via our social media outlets (Facebook, Twitter, Pinterest, or Instagram) generally spend approximately 2x more than the average J.Crew customer” (emphasis added). By driving meaningful engagement across a variety of social media channels, J.Crew’s data-driven marketing has succeeded in cultivating an online audience that spends twice as much as the average customer. When it comes to competitive positioning, J.Crew is right to identify Pinterest and Instagram as “significant growth opportunities.” According to a study from Vision Critical featured in the Harvard Business Review, 21% of the Pinterest users reported buying an item in-store after “pinning, repinning, or liking it.” The percentage was even higher among Pinterest users under the age of 35, with 36% reporting doing so. But as J.Crew noted in their filing, Pinterest is just one of many social channels they are employing to build an engaged fan based. To take a look at the content strategies driving J.Crew’s newfound success on social media, we analyzed J.Crew using our marketing analytics platform. ...Facebook is by far the most dominant social channel for J.Crew. With 1.2 million Facebook fans and counting, J.Crew has found success on the network with content that serves as a digital counterpart to their print catalog (which is referred to not as catalog, but as a style guide). Over the past year, the vast majority of J.Crew’s Facebook posts with the most social interactions featured a styled photo with short, relatable copy, and most importantly, a link to where you can buy the featured items on their website. ...With 480,000 followers and counting, J.Crew’s Instagram account is their second most popular social channel. Unlike the catalog-esque content on Facebook, J.Crew approaches content creation on this more image-focused network as an opportunity to cultivate a J.Crew culture. Notice that among their most engaging posts from the past year, few are peppered with links to the online store. Rather, the images are supported with branded hashtags — and a few links to the J.Crew blog. I thought this was a really interesting article about how J.Crew utilizes social media. Although the article fails to mention that J.Crew was late to board the social media bus. Remember when J.Crew's Twitter account was silent for the longest time? Remember how long it took for them to get a blog? What are your thoughts on this article? Do you feel like J.Crew has harnessed the power of social media? Do you think there are areas it does really well or really poorly with?